"An instant classic and must-have on every trombonist's book shelf. . . The highest recommendation for all bass trombonists. It's just perfect!" for auditions and concert performances. The Contrabass Trombone and Cimbasso, and Richard Strauss and the Trombone, as well as a Glossary of Selected German Musical Terms. 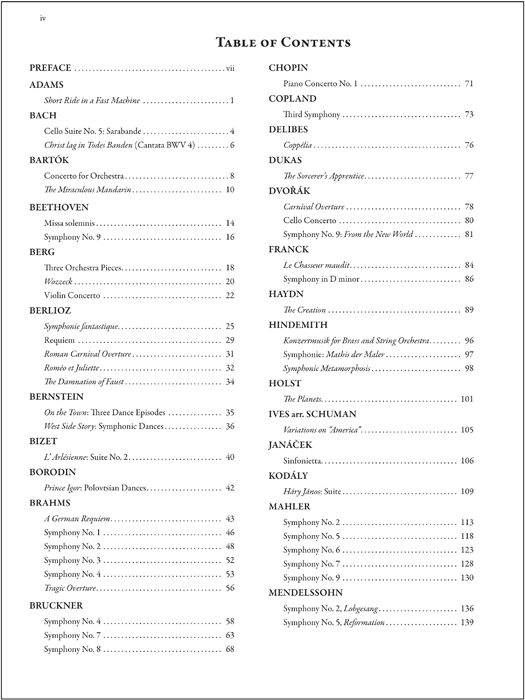 Front and back cover, Preface, Table of Contents, and four sample orchestral excerpt pages. Click HERE to order this new book. 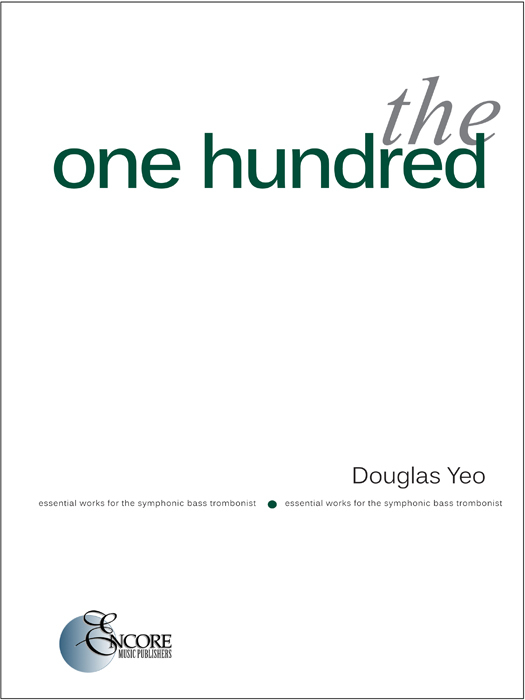 I am pleased to announce the publication of my new book, The One Hundred: Essential Works for the Symphonic Bass Trombonist. In a sense I have been writing this book since 1977 when I took my first audition for a major symphony orchestra. My own preparation for auditions and concerts has always involved getting the most and highest quality resources to inform my performance. This has involved reading biographies and autobiographies of composers, studying the full orchestral score, listening to recordings and live performances, and obtaining complete bass trombone parts and orchestral excerpt books. I learned early on that the more resources I had, the more information would would help my preparation and playing attain the highest possible level. When I was entering the audition circuit almost 40 years ago, the Internet did not exist. Complete parts to orchstral works were very expensive and I relied heavily on orchestral excerpt books by Allen Ostrander, Julian Menken, Keith Brown, Alfred Stoneberg, Henry Charles Smith, Franz Seyffarth, Bruno Ferrari and Karl Hausmann. These were the best resources available to me and they were all extremely helpful. Early in my career, my preparation was informed by my teachers, Edward Kleinhammer and Keith Brown, both of whom had extensive experience as members of great orchestras. Edward Kleinhammer played bass trombone in the Chicago Symphony for 45 years and Keith Brown had been a member of the Metropolitan Opera Orchestra and the Philadelphia Orchestra before becoming Professor of Trombone at Indiana University. But as I got further away from my college years and more and more repertoire found itself on my music stand, my preparation required more from me, first, as I took auditions and secondly, as I prepared music for concerts. In my preparation, I began noticing problems with all of the sources that I relied on to inform my playing. Publishers were not always clear with their markings; parts and scores often had obvious mistakes. Some editions appeared more reliable than others. Often I would ask myself, "What source can I trust?" As a result, I began taking notes, and writing down questions I had about all of the music that I prepared and performed. Over the last four decades, I have talked with colleagues, other players, and teachers, and had lively discussions about the intentions of composers. I learned that some publishers were generally more reliable than others; some publishers were known for their many errors in their music. I also began studying the manuscripts of composers themselves in an effort to understand their intentions. Matters of articulations were often misread by copyists and publishers and in recent years, more and more "critical editions" of works based on the most recent scholarship have begun to appear. Unfortunately, old, error-filled editions are still around and players continue to trust parts that have been shown to have many mistakes and problems. And I learned that even "critical editions" sometimes have mistakes. In some cases, I would confront a situation in a piece that had to do with performance practice. How loud is this forte dynamic really to be played? What other instruments are playing with me? Where should I sit on the stage if I'm the only trombone player in the piece? What is the harmonic structure of this passage? When I played along with the basses of the chorus, what was the text they were singing? I wanted answers and I left no stone unturned to find them. Once I joined the Boston Symphony Orchestra and my audition days were over, I worked with hundreds of students in lessons and masterclasses who were preparing music for auditions and performances. I got to know their tendencies; I saw how they prepared. I kept taking notes so I could give better advice in the next lesson. Over the years, I played the standard orchestral repertoire many times over and I learned a lot about how to play this music from my colleagues in the Baltimore and Boston Symphonies and from conductors who interpreted this music. All of this has been going on with me for a very long time and in September 2015, events converged so I was given the opportunity, at last, codify all that I had learned about the symphonic repertoire in one place so it could be a helpful resource for others. It was at that time when Wesley Jacobs, former tubist with the Detroit Symphony and owner of Encore Music Publishers, approached me about writing a new book for bass trombonists. I had been aware of his book, The One Hundred: Essential Works for the Symphonic Tubist, and the book by my friend, Megumi Kanda, Principal Trombonist of the Milwaukee Symphony, The One Hundred: Essential Works for the Symphonic Tenor Trombonist. These books are models of what an annotated excerpt book should look like. When asked if I would like to write the book for bass trombonists in The One Hundred series, it took me all of one second to say YES. Over the last 18 months, I have worked every day to put together this new book. I started by looking carefully at Megumi Kanda's tenor trombone book in this series. It provided a great model for me as I thought through how I would like my bass trombone book to be organized. I developed a series of parameters for the kind of content and layout that I would like to implement. Next was to establish a table of contents. Our goal was to include music from 100 works. I worked through all of the professional audition lists I have collected through the years, from auditions that both my students and I had taken. Next, I went to the Boston Symphony Archives and looked at the programs to every concert I played with the orchestra. I then visited the Archives of several other American symphony orchestras and looked at their annual programming for several years. By then, the list of frequently performed works that had significant parts for bass trombone was quite large and some decisions needed to be made. At the outset, we were determined to do this book in the right way. Many of the works that we wanted to include in the book are currently under copyright. In order to include copyrighted works in the book, we needed to approach the copyright holders and obtain a license to reproduce their music; this also required our paying royalties to reproduce these works. The protection of copyright and intellectual property rights is very important to me and putting this book together in a way that was both comprehensive and legal was a primary goal. This allowed for the inclusion of copyrighted works like symphonies of Dmitri Shostakovich, works by Serge Prokofiev, John Adams' Short Ride in a Fast Machine and Leonard Bernstein's Symphonic Dances from West Side Story, works for which their bass trombone part cannot be legally obtained anywhere else. We decided to work to get the rights to 30 works that are under copyright. Therefore, my initial list of 100 works became 110 works since we anticipated that several copyright holders might not agree to allow us to reproduce their work. As it turned out, all but one was happy to have their music included. This presented us with another decision: Do we cut the number of works from 109 to 100 or do we just go ahead with including all of the works that I felt were important to include? I was very pleased when Wesley Jacobs agreed that even though it would make the book longer, it should be as comprehensive as possible. 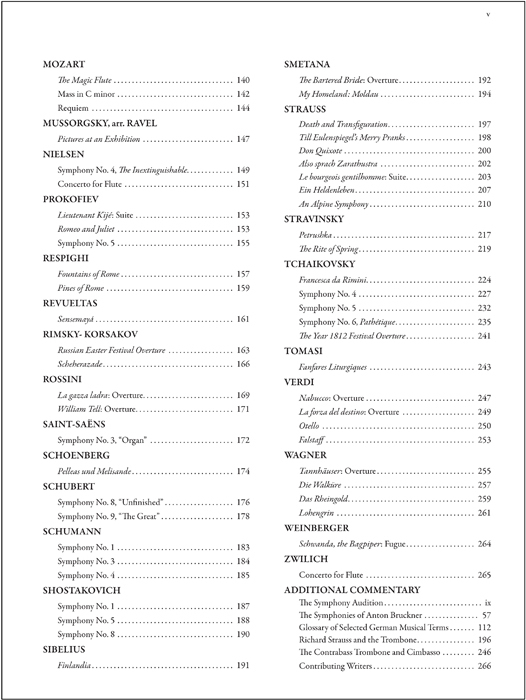 While the name of the book is The One Hundred: Essential Works for the Symphonic Bass Trombonist, we did not think anyone would complain if we gave them 109. With the table of contents set, I then turned my attention to choosing the most important passages from each work for inclusion in the book. I started with the passages that are most frequently included on symphony orchestra audition lists. I then added passages that are important to work on not simply for an audition, but to prepare a piece for performance. Some works have a single excerpt while others, like Gustav Mahler's Symphony No. 5, have 12 excerpts. I sent the passages to Wesley Jacobs who entered them into the music writing program, Sibelius. In addition to choosing the excerpts for each work, I also decided that it was important to include a tempo and metronome marking for each excerpt. This required devising a system so readers would know when a composer had provided a tempo at the beginning of the excerpt, or if the tempo was the most recent one that the composer gave before the excerpt, or if a metronome marking was a suggestion of mine rather than one given by the composer. In addition, there were times when I wanted additional information included with excerpts, such as parts for the other members of the trombone or low brass section (such as in the first page of excerpts for Brahms' Symphony No. 4, at left) or the text that the basses of the chorus is singing so one can plan good places to breathe in a passage based on the text (such as the first page of the Kyrie from Mozart's Requiem, at right). 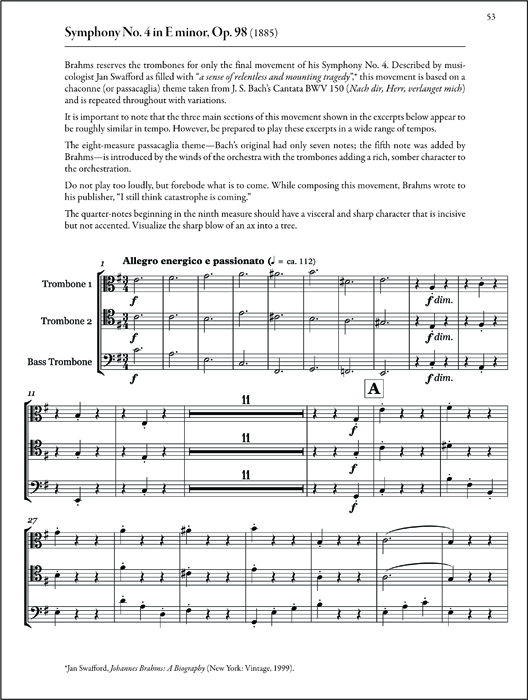 Sometimes I added suggested breath marks or slide positions in brackets, or provided alternative renderings of a passage when a composer's manuscript is ambiguous (as is the case with the Berg Violin Concerto, Brahms' Symphony No. 1 and Rossini's Overture to La Gazza Ladra. As the music for the passages I had chosen for each work was coming together, I began work on my commentary for each excerpt. I went back to all of the notes I had compiled over the years, identifying particular places where I wanted to bring something to the attention of readers. I often discuss how conductors like particular passages to be performed, and sometimes I would raise questions that are good to ask of your conductor. Historical context is very important in preparation of all music so I often wrote about things I have learned when studying composers and their works. I corrected many misprints - these are always discussed in the commentary - and mentioned when there are various editions that may come across a player's music stand. Some of the corrections I made are very small - such as the addition of a single staccato marking that was left out in a part. Other times, wrong notes, incorrect slurs, and missing dynamics were corrected. All of this is discussed in the commentary and my commentary was informed by no fewer than five sources for each piece. These sources included facsimile editions of composer's manuscripts, full orchestra scores and full published parts. Books about composers and dissertations and scholarly articles about individual pieces also were consulted. My goal was to provide bass trombonists with the most accurate representation of music that they will see at an audition or a performance. In addition to working to provide the most accurate music for each work that is currently available - and in some cases there were significant errors that needed correcting, especially in a work like Schubert's Symphony No. 9 "The Great" that has been vexed with terrible editions since it was first published (see the first page of excerpts for this work at left) - the book has several other helpful resources. A photograph of each composer has been included along with a biographical sketch by two contributing writers, Charles Greenwell and Byron Hanson. You can see an example of this at right, in the first page of excerpts from Strauss' Death and Transfiguration. This information, along with the dates for each composer and opus number and date of composition for each work gives readers more information with which to contexualize and prepare the music. Because I want this book to be as helpful as possible, I also wrote four essays to help provide additional insight to how one can approach the music in the book. The first is an article on the symphony audition process, with insights from my many years of serving on audition committees. Providing readers with a perspective of the audition from the point of view of the audition committee will, I hope, be helpful. I also wrote an article about challenges we face in Bruckner symphonies, particularly the interpretation of his dynamic and articulation markings. 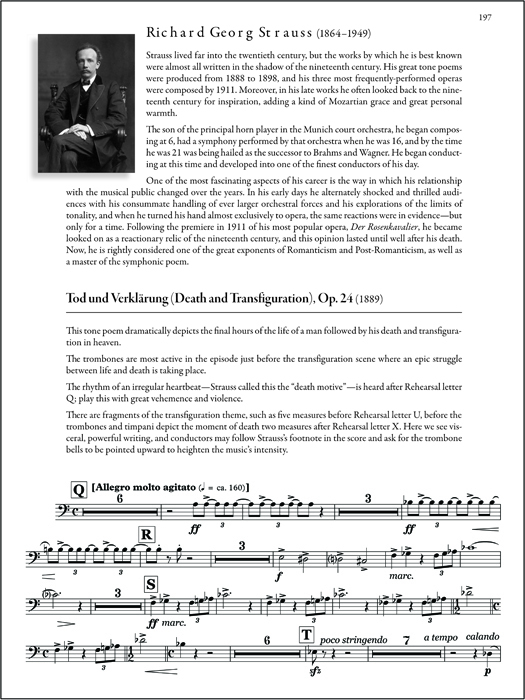 An article about the contrabass trombone and cimbasso is designed to give guidance to players who want to know when these instruments are appropriate to use, and my article about Richard Strauss and the trombone pays tribute to the composer who has the most works included in the book - seven. In addition, I have included a glossary of select German musical terms. In this I was assisted by my friend, Howard Weiner, one of the most respected scholars on the history of the trombone who, while he trained in the United States as a trombonist (studying at Northwestern University with Frank Crisafulli), he now makes his living as a scholar, writer and translator in Germany. His involvement ensures that my German translations are accurate in the context in which trombone players see these words. 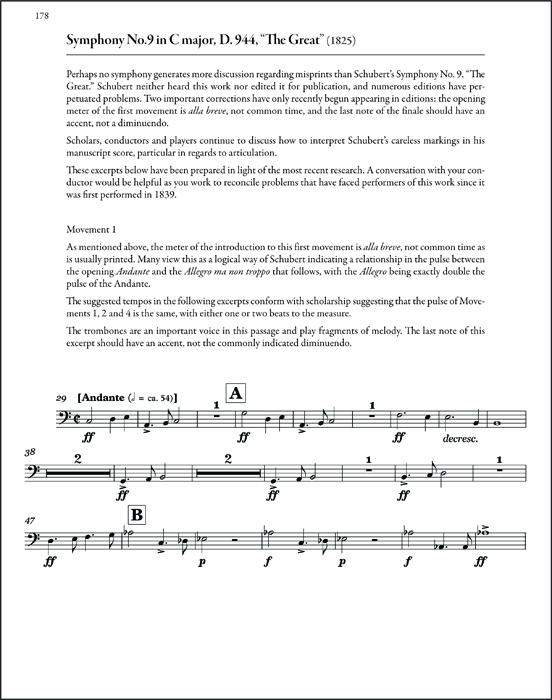 With the music inputted in Sibelius and my commentary written, we then turned our attention to the layout of the book and the tremendous task of proofreading. The book has many components and it is important that it not only be accurate, but that it have an easy, appealing look to the eye. We worked very diligently to ensure that there are no bad page turns and that the music is clear and easy to understand. The book comes with a durable coil binding so it will lay open on the music stand; this is always important with a large book. We have provided margins large enough for readers to write their own comments as they work throught the music and the book is printed on high quality, durable paper in a format (12 inches x 9 inches) that enhances readibility. I am also very pleased that even though my book is 288 pages, the cost of this book is the same as the books for tenor trombone (192 pages) and tuba (134 pages) in this series by Megumi Kanda and Wesley Jacobs. It is my hope that this book will help you better experience the unbridled joy of this music, an experience my teacher, Edward Kleinhammer (bass trombonist, Chicago Symphony Orchestra, 1940-1985), often referred to as "a keyhole peek into heaven," and gain greater understanding of and appreciation for the role we bass trombonists play in that extraordinary ensemble we call the symphony orchestra. 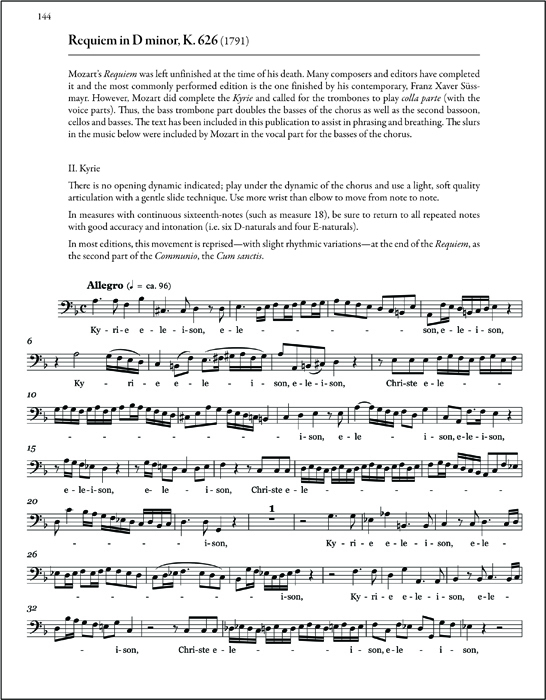 I have put together a sample of 10 pages from The One Hundred: Essential Works for the Symphonic Bass Trombonist that includes the front and back cover, the Preface, Table of Contents and four pages of excerpts and commentary; these PDF pages may be viewed and downloaded for free by clicking HERE. For information about the three books in The One Hundred series (for tenor trombone, bass trombone and tuba) visit www.the100.info. For more information and to order this book from Encore Music Publishers, click HERE. UPDATE: While I made every effort to ensure that The One Hundred: Essential Works for the Symphonic Bass Trombonist was free of errors, a few small things escaped my proofreading eye. Click HERE to view and download a list of corrections (PDF file) that will be incorporated into the next printing of the book. ©1996-2018 by Douglas Yeo. All rights reserved. Header photo of Douglas Yeo by Michael J. Lutch. Used with permission. All rights reserved.